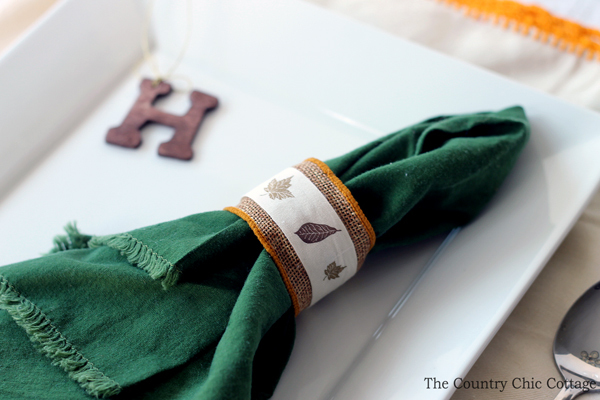 If y’all need Thanksgiving napkin ring ideas, I have the post for you! 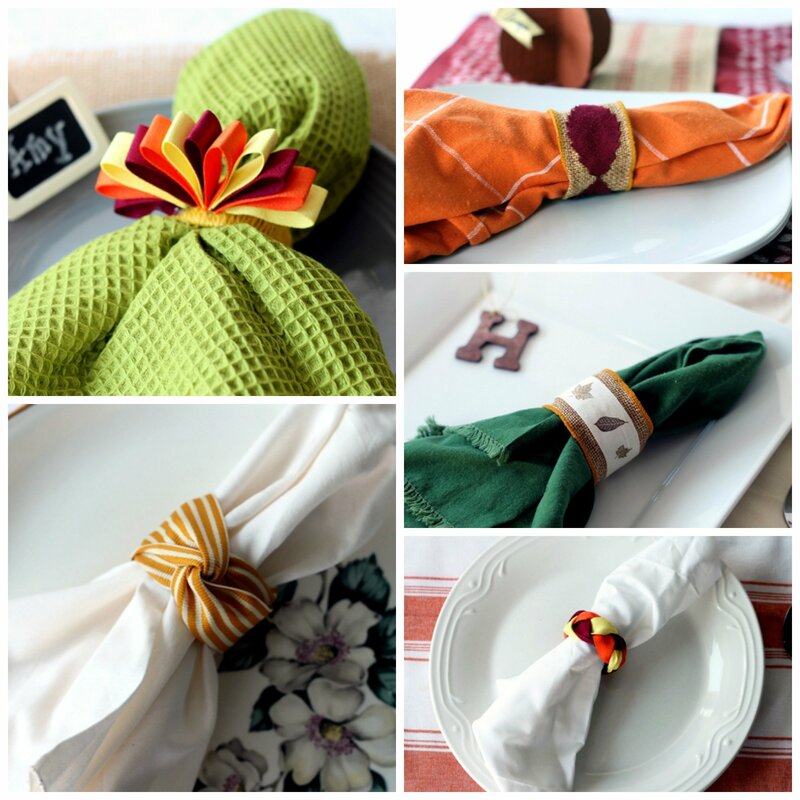 I used ribbon to create 5 fun Thanksgiving napkin ring ideas. I am including the tutorial on how to make all five in the post below. Plus if you love May Arts ribbon, you might just want to scroll to the bottom of this post and enter the giveaway! This post is sponsored and contains affiliate links however all projects and opinions are my own. This post is sponsored by The Ribbon Resource which is the online store of small consumer friendly quantities of May Arts ribbon. If this sounds like a dream come true for you, you will want to be sure to check out their site and enter the giveaway. There will be two winners and you can choose the ribbon of your choice! You will also need a toilet paper or paper towel roll. 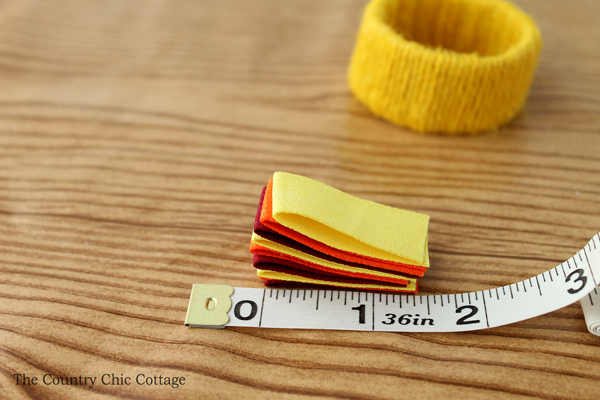 These are actually the perfect size for a napkin ring and well…they are free! Cut off a small 1 to 2 inch piece from your cardboard tube. Cover it in the yellow cord as shown in the image below. You will need to secure the ends with hot glue. Then cut the yellow, orange, and red suede to about 3 inch lengths. Fold in half as shown in the image below. I used four pieces of each color to get a fuller turkey fan. 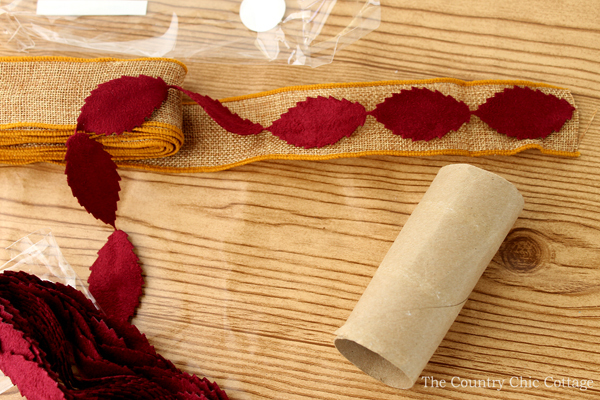 Use hot glue to secure the ends of that entire bundle of ribbon to the covered ring. Hold in place for a few seconds then release. The ribbon will fan out to look like turkey feathers. One napkin ring down! Now you just have to create additional ones for the other guests at your holiday table. I used clothespins to hold the ribbon as I worked. Braid just as you would if you were braiding your ponytail. 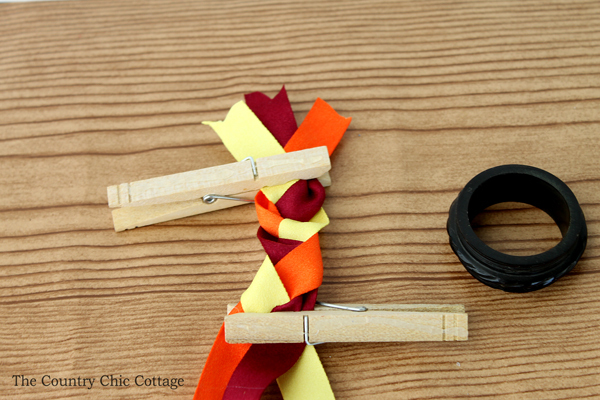 Use hot glue to secure around a wood napkin ring. Trim the ends once everything is secure. 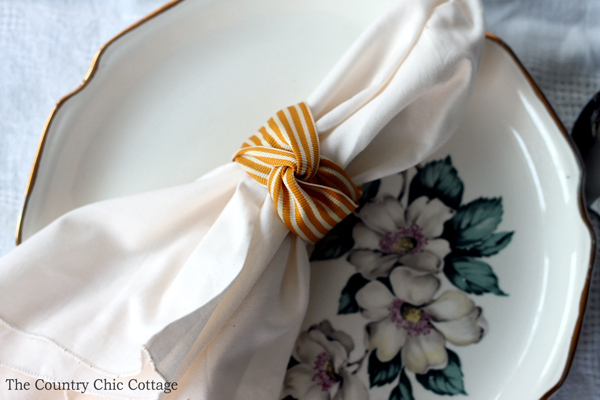 A simple yet elegant touch to your Thanksgiving table! 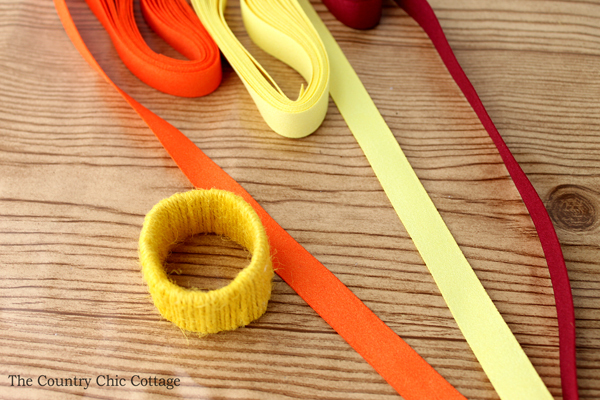 Pick and choose the colors of ribbon that will match any plans you have for your holiday table. This idea will transition well to other holidays as well. 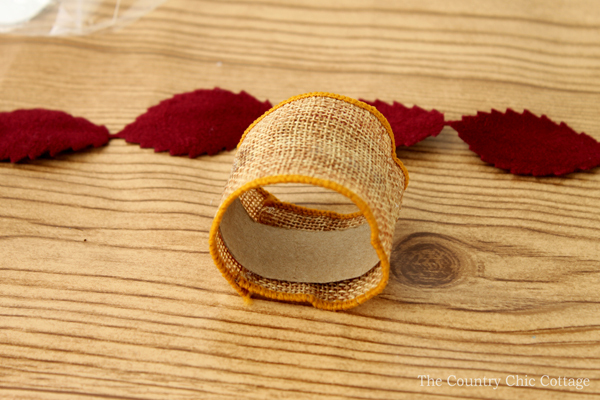 Next is a napkin ring idea that can be completed with the ribbon of your choice. 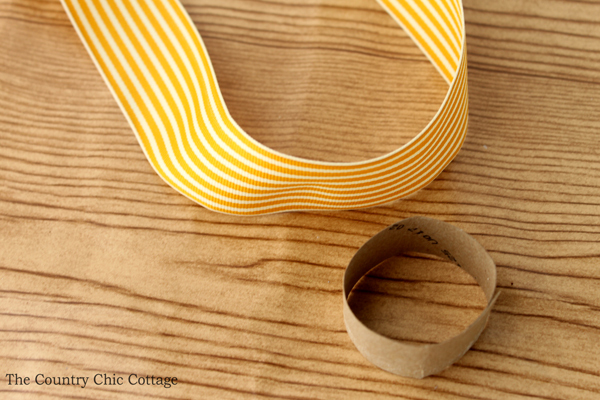 I used a length of this butterscotch striped ribbon. Literally bring a large piece around from the back of the toilet paper roll, twist around itself in the front, then just bring the loose ends around to the back. Secure the ends with a bit of hot glue in the back. How easy is that?? Your guests will never know that it only took you a few seconds to create these beautiful napkin rings. One tip is to make sure that your toilet paper roll length is 1/2 an inch less than your ribbon width so it does not show. Note that if you choose different ribbons, the width of the base ribbon should be slightly larger than the width of the leaves. Trim your toilet paper roll to about one inch long. 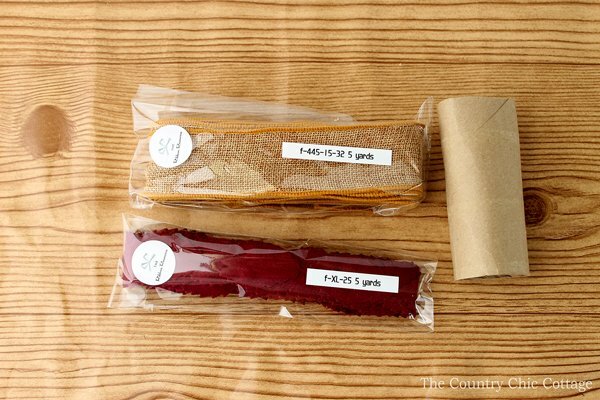 Cover the outside with the burlap ribbon and hot glue into place. 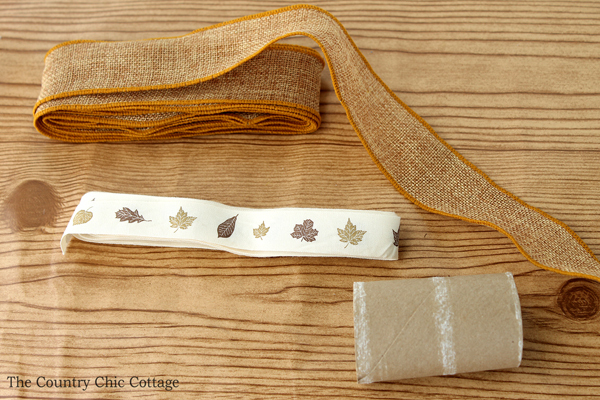 Add the felt leaves on top of the burlap and again use hot glue to secure. 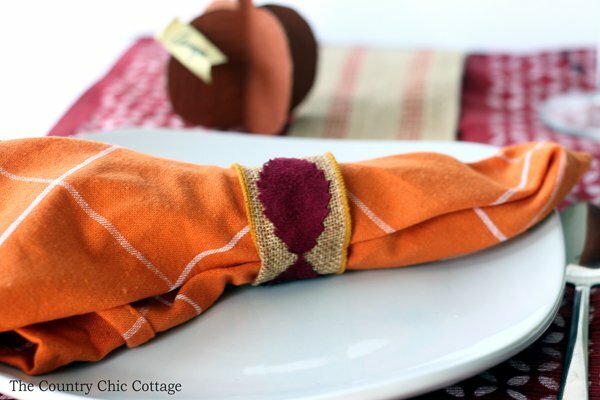 This gorgeous napkin ring will really bring out those fall colors on your table. 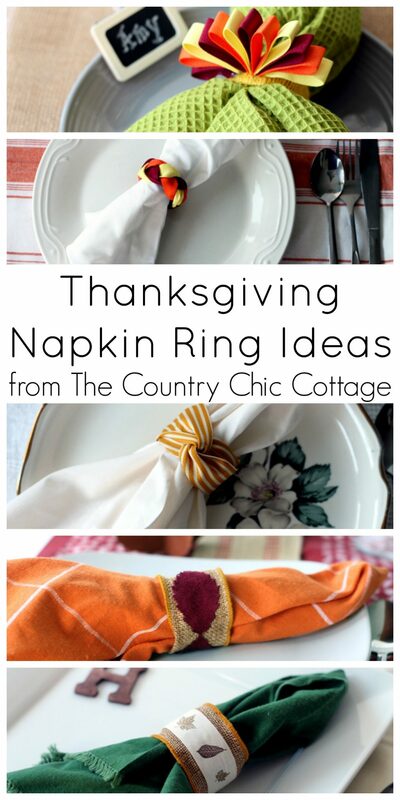 Basically repeat the same steps as for the felt leaves napkin ring. Hot glue both ribbons stacked to a piece of the toilet paper roll. 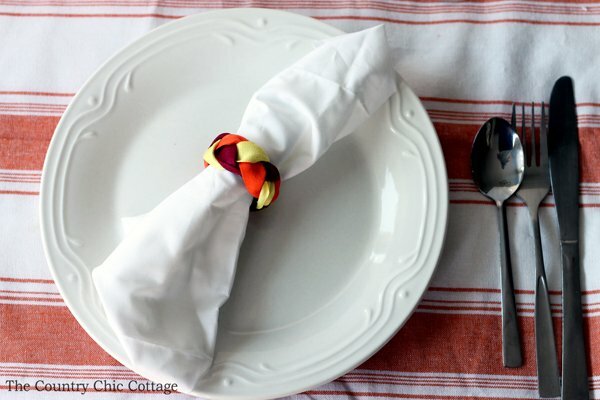 This super simple monochromatic design will work on almost any Thanksgiving table. 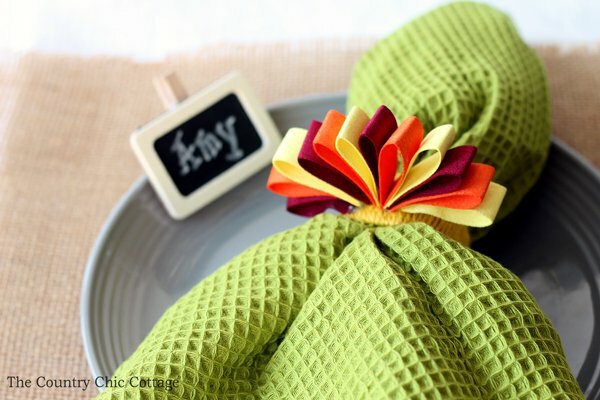 If you are looking for Thanksgiving napkin ring ideas, try one of our versions or let our ideas jump start your creativity into your own unique creation. Be sure to pick up ribbon from The Ribbon Resource for these craft projects and any others that you are working on. 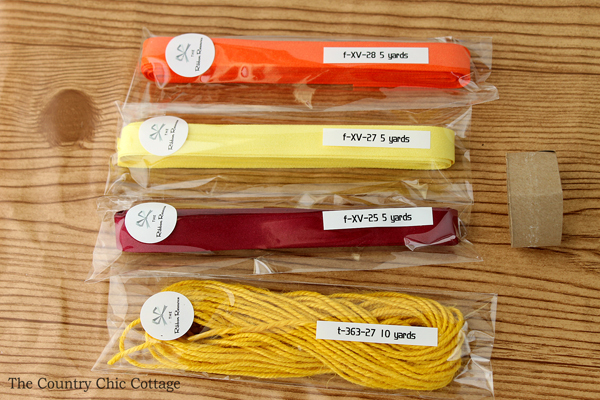 Remember that you can now order small quantities of May Arts ribbons for all of your craft project needs. Now I promised y’all a giveaway! 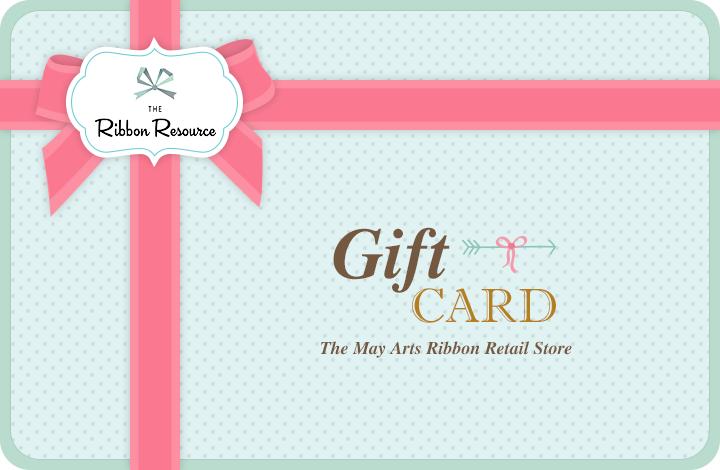 You can enter to win one of TWO $25 gift cards to The Ribbon Resource! Just enter to win using the rafflecopter form below. You must be 18 years or older and a US resident to enter. Prize is furnished by The Ribbon Resource. Void where prohibited. Winner will be announced in the widget below once the contest ends. Winners have 72 hours to respond once contacted or an alternate winner will be notified. Good luck y’all! I love ALL of these ideas but those red suede leaves are AWESOME!! Thanks for the giveaway!! I like the first one with the loops best. It could work for lots of situations. I really like the green napkin with the leaf printed ribbon. I like the first one with the loops! Super cute! they are all pretty but the orange or the dark green would be my favorite. I like the simpleness of them. they really show off the pattern in the ribbon. thanks for the ideas for making the napkin rings. The Turkey Fan reminds me of fall the most. I love the multiple colors. Hard to pick but the leaves are my favorite!